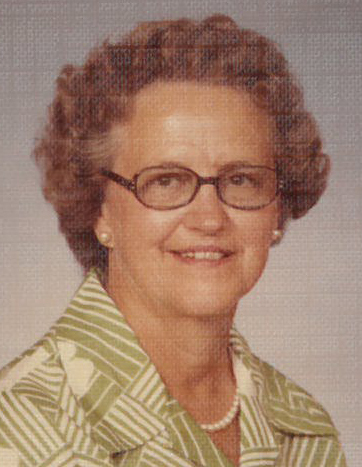 Obituary for Mary Louise Jenkins | McKee Mortuary Inc.
Mary Louise Jenkins, 96, North Manchester passed away April 6, 2019 at 11:46 a.m. at Peabody Healthcare Center, North Manchester, IN. One of four children, Mary Louise was born December 16, 1922 in Kosciusko County, Indiana to Ralph and Minnie (Keister) Metzger. On August 3, 1945, she married H. Delmar Poland and they had one son. Delmar passed away in 1949. She then married Merritt Jenkins on August 24, 1968. He passed away June 19, 2006. She graduated from Silver Lake High School in 1941. Mary Louise was a fantastic quilter, she made something for all of her grandchildren. She enjoyed traveling across the U.S. in her motor home with her husband and wintering in Arcadia, Florida. She enjoyed playing euchre with her friends and family. She was a member of the Manchester Church of the Brethren and belonged to the CBWF which made quilts and knotted them for the Manchester Early Learning Center and newborns. She retired from Bryan Manufacturing as a payroll clerk after many years of service. Mary Louise will be dearly missed by her son Paul (Cheryl) Jenkins, Warsaw, Indiana; her daughter Janet (Robert) Glick, Goshen, Indiana; one daughter-in-law Sharon Poland, Wabash, Indiana; seven grandchildren Troy (Leah) Poland, Wabash, Indiana / Travis Poland, Wabash, Indiana / Gary (Nancy) Jenkins, Spencer, Indiana / Amy (Steve) Hossler, Warsaw, Indiana / Kristi Gilbert, Elkhart, Indiana / Michelle (Chris) Ponciroli, Goshen, Indiana, and Sarah Glick, Middlebury, Indiana. She was preceded in death by her parents, her husband, one son Karl Poland who passed away on September 3, 2010 and three grandchildren, Karla and Timothy Poland and Laura Glick. Friends and family may call Wednesday, April 10, 2019 from 11:00 a.m. to 1:00 p.m. at McKee Mortuary, 1401 State Road 114 West, North Manchester, IN. Funeral services will begin at the conclusion of calling. Pastor Karen Eberly will officiate and burial will be held at South Whitley Cemetery, State Road 14 & Whitko Drive, South Whitley, Indiana 46787. For those who wish to honor the memory of Mary Louise Jenkins, memorial contributions may be made to Heart to Heart Hospice, 7221 Engle Road, Suite 100, Fort Wayne, IN 46804 or Peabody Caring Circle, 400 West 7th Street, North Manchester, IN 46962.